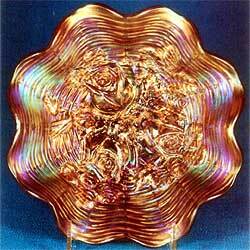 Sherman Hand once said that if there was ever to be a bridge between Carnival and Art glass, surely the Rose Show and Poppy Show patterns would lead the parade. I agree. There just aren’t enough adjectives to describe the elegance of these pieces. It’s a shame we don’t know more about the background of these two patterns. They have been attributed to Northwood, but no proof positive has ever been established. 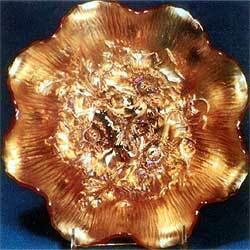 The non-fluted, scalloped edge, the indented flowers, and the reverse patterns are not typical of Northwood. To my knowledge a signed piece has never been found. The one piece of circumstantial evidence that does point very convincingly to Northwood is the aqua opal and pastel colors in which these patterns were produced. Still further evidence, it should be mentioned is the fact they were not made in red or peach opal, two colors not associated with Northwood. 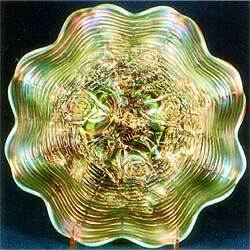 I discussed these patterns with the late Bill Heacock on several occasions. He had explored the possibility that perhaps some other company owned the molds and Northwood pressed the glass on a custom basis, much like the more recent relationship between L. G. Wright and Westmoreland. 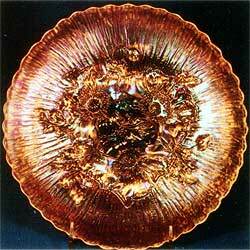 At one time Bill felt that perhaps the Jefferson Glass Company may have played a role in this mystery. On the basis of what we have to work with to date, Northwood seems to be the most logical choice as to the maker of these exceptional patterns, but the proof needed to nail it down is still missing. The Rose Show Variant is a separate story and I have not attempted to cover this Variant pattern in this article. One of the favorite topics for discussion among collectors is which of these two patterns they prefer. My experience shows it a close call with perhaps a slight edge in favor of Poppy Show. The Rose Shows are a tad more available and will sell for a touch less than the Poppy Show in most cases. The Rose Show is found in a wider range of colors than is the Poppy Show. 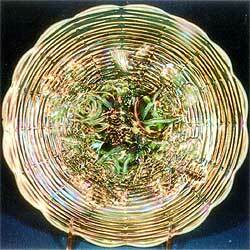 These two patterns were made only in bowls and plates. There was only the one mold in each pattern, as the bowl and plate were simply shaped differently after coming from the same mold. 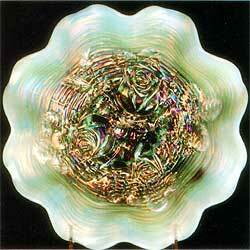 There is no variation in the shape of the bowls in either pattern. They are all eight ruffle. 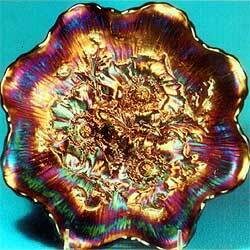 Ice Cream shape bowls have been reported, but the ones I have seen are actually deep plates. I should point out that I do not consider the so-called Poppy Show vase as the same pattern and we know the vase was made by Imperial. 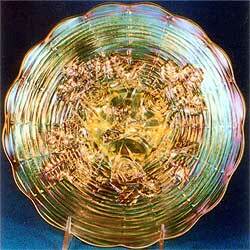 It is an interesting twist that the Rose Show was made in some volume in an aqua opal bowl. While a plate or two has been reported, I have not been able to confirm that it actually exists. 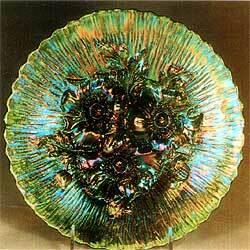 On the other hand, three plates are known in aqua opal in the Poppy Show, but no bowls have ever been found. It should also be pointed out that some confusion exists as to ice green opal and lime green opal. 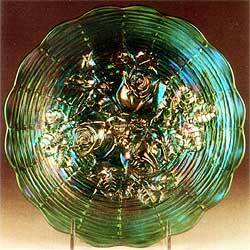 For some reason we refer to the Rose Show bowl in this color as ice green opal, but the plate in the same color is called lime green opal. I have listed them that way. There is also some confusion between ice green and vaseline. The two colors seem to shade into each other on occasion and how we label them is largely a matter of personal choice. 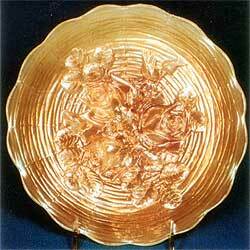 I call the Rose Show plate in Photo 1 vaseline. Some might call it ice green, but there is too much yellow in it for me to call it anything other than vaseline. While these prices are high, I predict they will be still higher by the time this issue of The Pump comes out. And in my opinion, if there are any patterns in the entire Carnival spectrum where this would seem to be more than justified, it has to be the Rose Show and Poppy Show pieces. 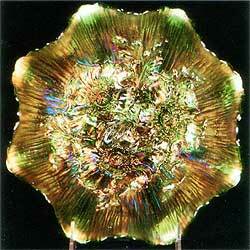 © International Carnival Glass Association, Inc.